green tea: Time for a geography lesson. Ooooookay, people. It has become blatantly obvious that many (uh, most) of you don't know where Bhutan is. That's alright, not everyone is as much of a geography geek as me. Also, it's not a very big country. To help you out, I've swiped a bunch of maps from all over the Internet. I hope this side of the planet is at least somewhat familiar to you. Focus on the blue blob. 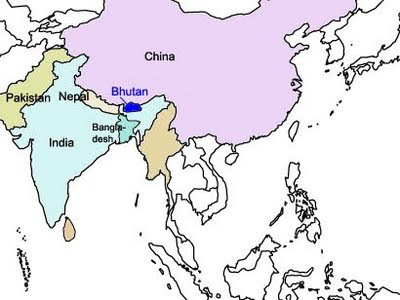 The BBC map gets political by calling the bit to the north Tibet instead of China. And here we are. I'll be arriving at Paro in the west, the location of Bhutan's only airport. 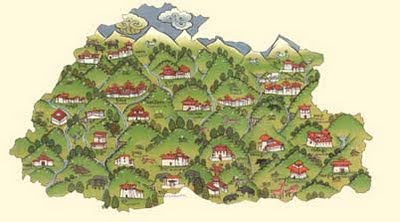 In 11 days, I hope to make it a little past Bumthang in the centre/east, and back again. Actually, I hope this map is the most accurate because it is so very charming. Extra credit: Bhutan is situated on the southern slope of the Himalayas. The mountain range was formed through the process of orogeny which occurs when two continental plates collide and layers of rock are thrust upwards. The Indian plate is drifting northwards and is subducting beneath the Eurasian plate. The Tibetan Plateau is on the higher Eurasian plate while Bhutan is on the lower Indian plate. A few years ago I read "Beyond the Sky and the Earth: A Journey Into Bhutan". I've been intrigued by the very idea of Bhutan ever since. Enjoy your trip, and beware of the hot peppers. 9. Down on the 24hrs crossword today was "Small country next to India".